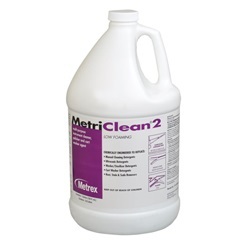 MetriClean2 1 gallon liquid cleaner that comes in a jug. An alkaline pH, low-foaming, concentrated liquid cleaner for stainless steel instruments and cart washers. Cleans blood and inorganic soils, removes stains, restores shine, and increases instrument functionality. For use in most water conditions. Manufactured by Metrex.